Wooster and Mercer Lofts is another masterpiece created by Abdo. Truly new construction from the ground up incorporates modern design techniques and amenities while embodying the true loft spirit in every unit. An “It” Building Selection in four categories, Wooster and Mercer Lofts are coveted as Best Private Outdoor Spaces, Rarely Available, Most Modern and High Demand collections. New Listing: $1,495,000 Mercer Unit M602 2 bedrooms, 2 baths, 1,960 Sq. Ft. Luxury 2 bedroom, 2 bath penthouse loft, beautifully updated. Hardwood floors, floor-to-ceiling windows, and wraparound private rooftop deck with stunning DC views and Outdoor TV/Hot Tub! This unit has a 2nd floor loft that can be used as an extra sleeping area. Perfect Airbnb rental! Under Contract: $1,090,000 Mercer Unit M307 2 bedrooms, 2 baths, 1,652 Sq.Ft. Enjoy superb city-style living in the heart of Rosslyn, minutes from Georgetown & DC! 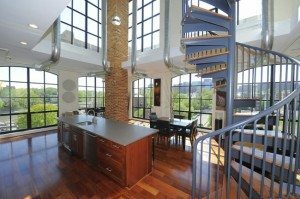 Breathtaking luxury loft, the finest in DC. The sought-after, amenity-rich corner unit features dramatic wide-open living space, flooding natural light from walls of windows, refined finishes galore and garage parking for 2! Review up to 5 years of sales stats at Wooster and Mercer Lofts.